Let us first understand what a domain name is. Just like your house has a unique address where people can reach you, a domain name is a unique address of your website on the Internet. I read this somewhere “A good website starts with a good domain name” – so rightly said. Through this blog, I will try to highlight a few markers regarding choosing right domain name for your company, blog or online business. Of course, you would require a domain name that helps to keep your business above your competition. It should be easy to type, easy to remember and give visitors something through which they can associate with your web site. I advise you to spend some time thinking about how you want to be remembered and perceived on the internet. Short domain names are always sought after. Domain names comprising of 3 to 7 letters are the easiest for users to remember compared to domains that are more than 10 letters. Ideally, your domain is identical to your company name. For Internet-based businesses, this will establish your brand. Typing your company name should bring your company up in the search results. If your business is local, consider including your city or state in your domain name to make it easy for local customers to find. Example: ahmedabadmirror.com. You can even choose to go in for a country specific TLD like .in (for India). That would also help you to rank better in the search engines. There is a difference in what we hear and what we read. Yes, you got it right – the pronunciations. People who hear your website address might misunderstand numeral (5) or letter (five). I advise to avoid those. If you still need these in your domain, register the different variations to be safe. On the other way round, hyphens help because it allows you to clearly separate multiple words in a domain name. For example, people are more likely to misspell “jbossserver.com” while “jboss-server.com” is quite clearer. Search engines give preference to domains that contain a frequently used search term. For example, if you type “24X7 Technical Support” in the Google search box, you will find that several of the top results will have the term “24X7 Technical Support” in their URL. Putting frequently used keywords in your URL may significantly increase your traffic and capture a greater portion of your target market. Very often, if you can’t get the domain name you want, the domain name registrar will suggest alternate forms of the name you typed. For example, if you wanted rock.com, and it was taken, the registrar might suggest you form like: therock.com, myrock.com, rocks.com. As per normal human tendency, people often miss out on the suffix ‘s’, which might land them on the wrong site, worse, competitor site. Also consider domain names including what products or services your company provides. For example, if the name of your company is “xyz apparels”, you may want to consider domain names that target what you sell. You can register “shoesforwomen.com”, “shirtsformen.com”, and “xyzapparels.com”. Remember that you can own multiple domain names, all of which can point to a single domain. The new generation e-commerce companies, social networks & web application businesses today are opting for new and unique names. Not advisable if you do not wish to allocate extra advertising budgets as they might not be as easy to remember. What if the Domain Name is not available? There are possibilities that you’ll come up with the perfect domain but become frustrated to findthat it’s already taken. Go back to brainstorm. Mix words, use tagline, nickname or a phrase. I hope these points outlined in my article will help you in choosing right domain name for your online business. 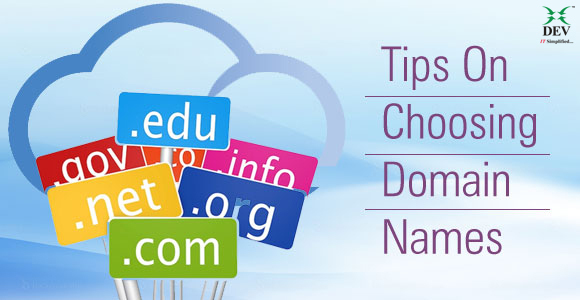 Choose your domain name wisely to leverage the power of Internet, better! Sr. Business Development Executive, Marketing & Sales at Dev Information Technology Ltd. I am enthusiastic, assertive and confident team player looking after the sales and marketing activities for Managed IT Services in DEV IT. I am avid follower of sports and music. Nicely written. The article really helps to gain right insights. How can I use multiple domain names to point to the same website but different pages? Basically, can each service page having it’s own specific domain name help as a gateway to website? Thank you for your kind comment. Yes, you can redirect the different domain names to the different pages of the same website through htaccess file. htaccess redirect is the most SEO friendly way to redirect domains. This allows instant redirects since the web server reads the htaccess file before showing the web page.